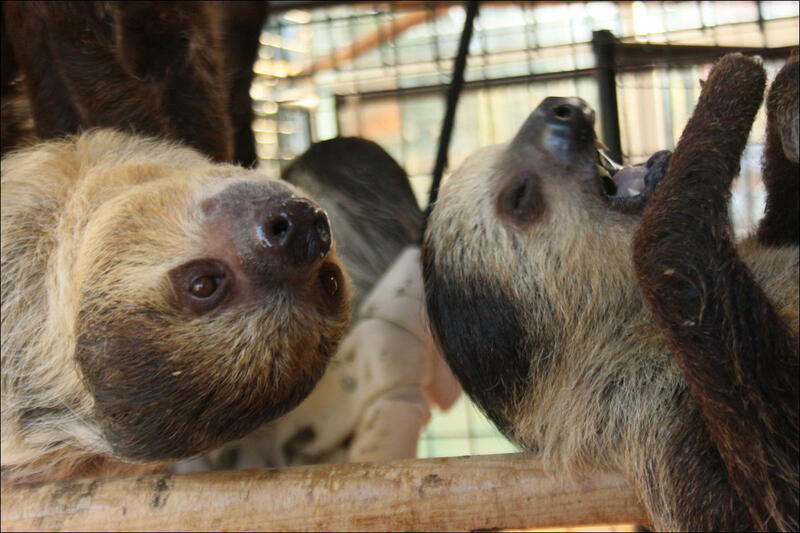 Two-toed sloths at the ZWCC Sloth Center in Rainier, Oregon, in 2014. The Olympia city prosecutor's office confirmed to public radio Thursday that it will file animal neglect charges in the next day or two against the owner of an Oregon-based sloth sanctuary. This is fallout from a raid two months ago on a satellite center under development in Olympia, Washington. Soon after officers twice raided a converted storefront in downtown Olympia, Thurston County Animal Services recommended charges of animal cruelty be filed against Zoological Wildlife Conservation Center founder Kellie Caron and an assistant Greg Golliet. The basis for the charges, according to Animal Services, is "failure to provide humane care" to seven sloths, two tortoises, an African anteater, three armadillos and an assortment of reptiles. The misdemeanor criminal charges could potentially complicate an ongoing civil trial in which Caron and Golliet are petitioning for the return of most of their exotic animals. "It was a wrongful seizure," Caron and Golliet's attorney Scott Milburn told a Thurston County District Court judge. During a non-jury civil trial Thursday, Milburn presented evidence and a witness to make the case that the animal care met federal government standards. Animal Services called their own witnesses including a veterinarian and the operator of another sanctuary. They testified to being shocked by the conditions in the former camera store. "There was no ventilation in there," said Mike Mesa, an animal rescue consultant who accompanied officers on the March 30 and April 4 raids. "The smell was pretty rancid. It stank because there was feces and urine." "The enclosures were pretty small," Mesa testified in regard to the cages for the sloths, armadillos and reptiles. He also alleged inadequate temperature and humidity controls and lack of "enrichment" amenities. 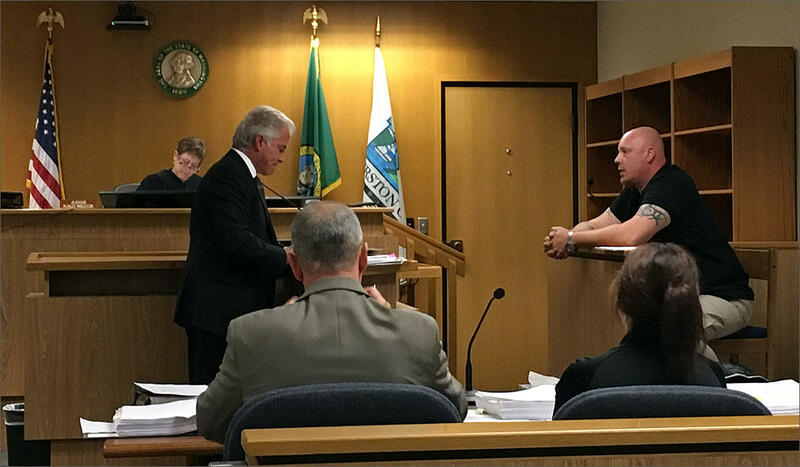 Attorney Scott Milburn cross examined Mike Mesa Thursday about Mesa's observations during an Animal Services raid in Olympia on Easter weekend. Mesa runs the Predators of the Heart sanctuary north of Seattle, which took in the seized animals and is still caring for them. Milburn said his clients are very concerned about the care the impounded sloths are receiving and would like to get them back as soon as possible. Caron and Golliet were in the process of remodeling the Olympia storefront when animal control officers raided the facility based on a tip that a ZWCC staffer was selling an Asian water monitor, a large, venomous lizard that is illegal to possess in Washington state. "It's intended to be a teaching facility," said Milburn about the planned rescue and education center in Olympia. "That's still their hope right now." The main ZWCC Sloth Center in Rainier, Oregon, was described in the operator's court documents as "the largest and most successful captive husbandry conservation and breeding program of sloths in North America." To the general public, the Sloth Center might be best known for the "sloth sleepovers" it offered occasionally. 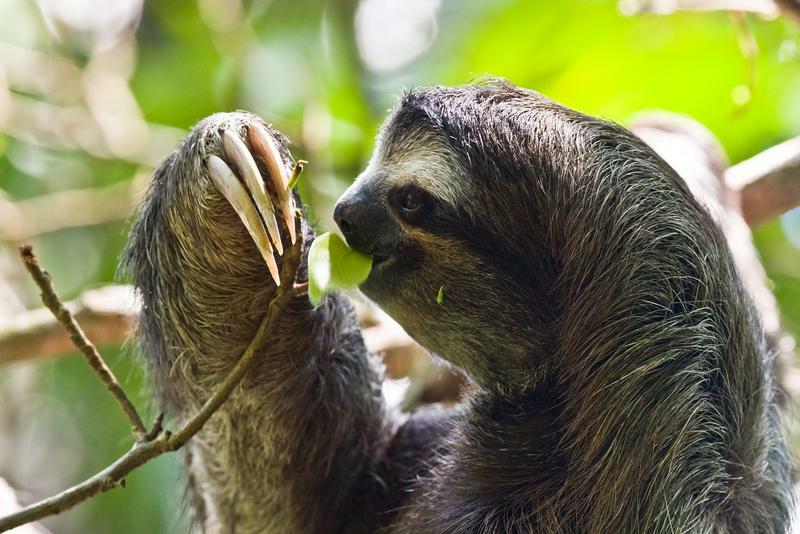 Two-toed sloths are native to Central and South America. Milburn said in court Thursday that six of the seven sloths seized from his clients were born in Washington though. A consultant for Animal Services who watched the court proceedings said some of the seized animals could eventually be moved to zoos if the government prevails at trial. "Feelers have already been sent out," Mark Baumann said. The civil trial in District Court about the disposition of the animals was adjourned Thursday by Judge Kalo Wilcox without a date certain to resume. You could almost start a zoo with all of the exotic creatures seized by animal control officers in Olympia about three weeks ago. Now the owners of an Oregon-based private wildlife center are petitioning to get their animals back.